Pallywood is manna-mania for anti-Israel Western media/activist industry, ‘Shirley Temper’ now it’s poster child……. – The Tundra Tabloids……. Pallywood is manna-mania for anti-Israel Western media/activist industry, ‘Shirley Temper’ now it’s poster child……. This is the Tamimi who, under the title “Palestinian human rights activist“, is heading to the US now for a month-long roadshow during September and October about which we commented a few days ago [“07-Sep-15: Peace, human rights, the sheer joy of killing people“]. Amnesty International which took him under its wing some years ago is among the groups paving his way in the US. Bassem is married to Nariman Tamimi. Their children include A’hed Tamimi, aka Shirley Temper, a front-and-center role that her kept her in the camera’s focus for the past five years [“06-Sep-15: The making of a pigtailed provocateur“]. 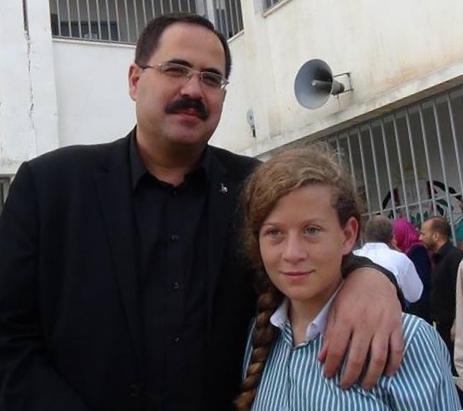 She is now about 15 and adored by Aljazeera [see their recent video promo] and by the PA Minister of Education (he’s the moustached one in the photo on the right, taken a week ago). Previous Post Previous Post Finland: Crazy judges force immigration office to approve more asylum applications, cite security situations in Iraq, Somalia……..
Next Post Next Post The Swedish kook: FM Margot Wallström doubtful UNSC meeting on Iran is necessary now……..